* Start by showing the students how small the larvae are. When they arrive your cats are three to five days old. * It’s not necessary to transfer larvae immediately when you receive them.We recommend you wait a few days after you receive the larvae to do the transfer as there is plenty of food to last five days. * You may also use the container and food in which they arrive as extra food for any extra larvae. * Put your caterpillar food in the fridge. When you take it out, warm up to room temp. * The cats will soon appear darker and active. This is the best time to transfer them. Do not transfer the caterpillars if they are motionless as they may be going through an instar. This is when they moult their skin and grow. They don’t like to be disturbed at this point. * Your cats should be active. Count the number of caterpillars and divide the food evenly. There may be up to 27 cats. * Wipe any moisture off the food with a clean paper towel or tissue Using a knife, cut the chunks evenly to the number of cats you have and divide it between the small containers. 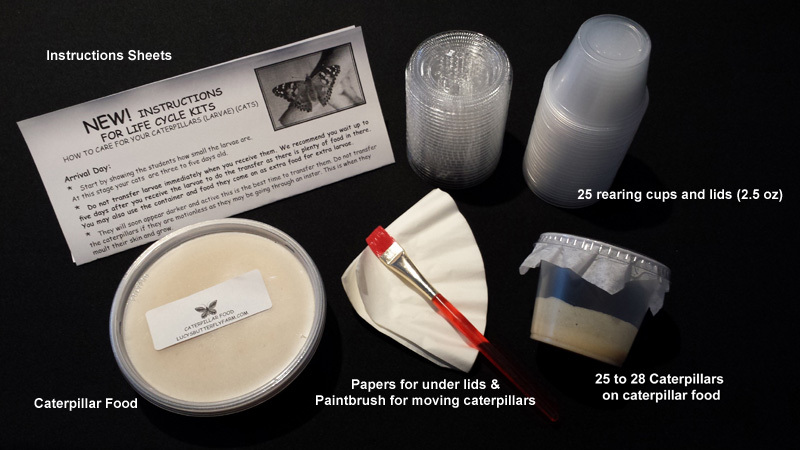 Transfer the food first, then the larvae, using the paintbrush. Then place the paper over the container and close the lid tightly. * You can place two cats in one container and just add its’ extra chunk of food. * Remember to keep the lids securely on at all times as they are little escape artists. so the food does not roll on top of the little critters. enjoyed as a group learning project. * Please leave the containers on a shelf at room temperature away from direct sunlight. Sunlight will cause condensation and excess moisture which is not healthy for the caterpillars. the frass. Make sure to leave the remaining food chunk. You may rest the caterpillar on the lid while you do this sweeping. Make sure to put the paper back under the lid for humidity control. If you need to replace the paper for any reason, use clean, dry coffee filter paper. We recommend you sweep out the frass twice or more to keep the frass from covering the food. * When you see red frass balls, the caterpillars have finished eating. They will soon attach themselves to the paper under the lid, hang upside down in a “J” form and transform into a pupa without your help. When this happens do not disturb the caterpillar or pupa for at least 48 hours until they have dried and hardened. The pupa is dry when it’s a brown/tan colour with little gold flecks. * Line the bottom of the flight cage with paper towels. * Do not pull the pupa away from the paper. After hardening, take the paper with the pupa attached from the container and pin the paper (using a straight pin) onto a netted side (not the top) of a flight cage, hanging down in a natural position. * If a pupa does not attach itself properly to the paper or falls off just rest it on the bottom of your flight cage on top of the paper towel and the butterfly should emerge as usual about eight days later. * Do not be alarmed by the red liquid that you see during emergence, it’s not blood. It’s called meconium and the butterflies use this fluid to pump up their wings. 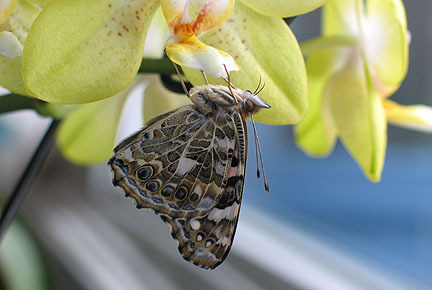 * During emergence the butterfly will pump up its wings and dry them for a couple of days. * The pupal stage will last eight to ten days depending on how warm the room is. Please never leave the insect, in any form in direct sunlight until release. Handle the larvae as little as possible especially during moulting or pupation. * The butterflies will usually not nectar immediately after emergence. If you keep them for longer than two days they will need to nectar. * Sliced oranges will do or a little orange Gatorade (yes, the drink!) Soak a cotton ball and place on a plastic deli lid at the bottom of the flight cage. This will attract them if they are thirsty and ready to nectar and provide the sweetness they require. You may see their little proboscis tube for feeding come out. * You may witness mating within two or three days of emergence. If you see two butterflies attached, they are mating. Please do not disturb! * Releases can be planned in time for egg-laying which usually occurs from 5 to 7 days after emergence. Please be sure to release on a warm day (24C is best), never in the pouring rain, and well before six pm. 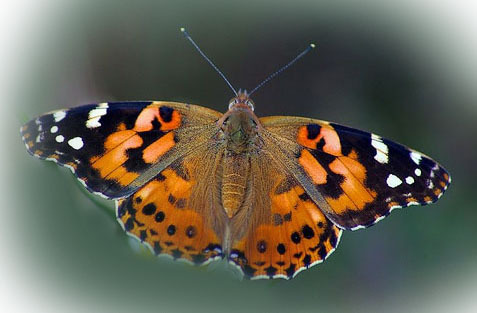 They are beautiful and hardy butterflies. Enjoy your Painted Ladies and Gentlemen.